In this project, we will go over how to build an ultraviolent (UV) LED Circuit. This is a circuit which powers a UV LED so that it gives off its UV light. It's a very simple circuit, only requiring a UV LED, a resistor and a power source (either a DC power supply or a 3 AA batteries). To power a UV LED, all we need is the right voltage and current. A resistor is needed so that we can bias and limit the current so that the correct amount flows to the LED. For this circuit, we will use 4.5V of power in order to light the UV LED. If you have a DC power supply, you can use this and adjust the voltage so that it outputs 4.5V or you can connect 3 AA batteries in series to produce 4.5V. Since each AA battery gives out 1.5V, 3 in series will give out 4.5V, since in series the voltages of batteries add together. For this project, the UV LED we are going to use is one provided by Sparkfun, Model No. YSL-R547P4C-E3 by China Young Sun LED Technology Co.
All the LED needs is approximately 3.3V dropped across it and 16-18mA flowing through it. This is the datasheet for the UV LED which we are using: UV LED Datasheet. The datasheet specifies that this LED should receive between 3V and 3.6V of voltage dropped across it. This is specified in the forward voltage specification. The forward voltage is the amount of voltage that hsould be dropped across the terminals, anode and cathode, of the LED. The datasheet also specifies that the LED should receive a maximum forward current of 20mA. This means that no more than 20mA should flow through the LED. Since we want to limit the current flowing through the LED to 20mA, we add a 250â„¦ resistor. Current= Voltage/Resistance. Therefore, 4.5V/250â„¦= 18mA. This is just about the right current we need flowing through the LED. If we choose a much smaller resistor value, we will exceed the 20mA maximum forward current rating. Exceeding this rating can damage or destroy the LED, so this should never be done. If you want to dim the output, however, you can use a greater resistance value. Now that we've built the circuit and it is emitting UV light, what are the uses of such UV light? What can we do with it? And the answer is, UV light has a ton of applications that can be used for a measure of stuff. UV light can be used to reveal security strips in US currency, it can reveal watermarks hidden in bank notes, it can notice flourescent ink and dyes used anti-counterfeiting measures in credit cards, it can illuminate scorpions, it can check hand stamps at amusement parks, scan a crime scene for foreign materials, and much more. Basically, UV LEDs and flashlights have broad use in detecting things that aren't visible alone with the naked eye. They are used greatly in security measures, especially to catch counterfeit bills and credit cards. 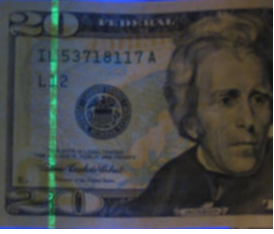 If you take the above UV LED that we've built and shine it on a $20 bill, it will reveal a green security strip that appears on the left side of the face bill. You can see above that a $20 US bill contains a security strip which will glow green under ultraviolet light. This is just one of the many applications that UV light has.